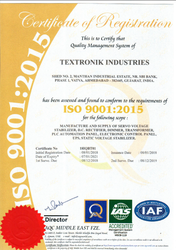 Incorporated in the year 2003, we, Textronik Industries, are engaged in manufacturing a qualitative assortment of Servo Voltage Stabilizers, Electric Rectifiers, Rectifier Transformer, Isolation Transformer and many more. Their longer serving life, compact design, less power consumption, easy operation and low working cost, makes these machines highly appreciated among our patrons. The offered range finds wide applications in various commercial, industrial and household applications. Offered by us at industry leading prices, these electronic and allied machines and equipment are highly appreciated among our patrons. We also provide Rectifier Repair Service. Owing to our large production capacity, we have been able to meet the precise needs of our valuable patrons in the most efficient manner. Ethical business policy has helped us in catering to the precise needs of our valuable patrons in the most efficient manner. Huge network of distribution has helped us in delivering the offered range of electronic and textile machines within the assured time frame. Standardized packaging of the offered range is assured, owing to our large packaging facility. In addition to this, we accept different modes of payment such as cash and online. Mr. Gopal M. Nalamwar is our marketing manager and he has helped us in catering to the precise needs of the diverse market trends in the most efficient manner. Backed and supported by his experience and knowledge, has helped us in attaining a commendable position in this domain. The optimum quality of the offered electronic machinery is never compromised at our end. Well-equipped with latest machinery and equipment, our in-house quality testing unit is known for carrying out standardized quality testing procedures. Our team of quality controllers checks the offered range of equipment and machinery on various parameters such as low maintenance, design, performance, sturdiness and durability. In addition to this, our in-house quality testing unit is upgraded at regular intervals of time. Since our inception in the year 1990, we have been backed by an ultra-modern infrastructure. it is spread over a wide area of land and is carefully divided into several units such as manufacturing, in-house quality testing, warehousing, packaging and sales & marketing unit, to ensure that all the on-going processes are carried out in the most efficient and streamlined manner. In addition to this, our infrastructure that is well-equipped with latest machinery, is known for its large production capacity. We have appointed a team of diligent and dedicated professionals, which has always been the strongest pillar of our success. This disciplined team of skilled and experienced professionals enables us to design and develop our products in compliance with the specifications detailed by the clients. They are well-aware of their responsibilities and are specialized in their respective tasks. Owing to the relentless efforts of our team members, we are able to run business smoothly by meeting the specific requirements of the clients. Our qualified engineers pay optimum attention towards inspection and testing of each and every product to offer a flawless range of products to our clients. Backed and supported by a team of dexterous professionals and state-of-the-art infrastructure, we have been able to cater to the precise needs of our valuable patrons. Large production line has helped us in meeting and managing the bulk demands in the most efficient manner. Timely delivery of the offered range of electronic and textile machinery is assured owing to our well-connected distribution network. Being a quality conscious name, we assure that the premium quality of the offered textile machines and equipment is never compromised.